The saddle is also suitable for Endurance, in fact Scottish Team member Marjorie Grant used to use her saddle for Endurance before she purchased her Evolution, Here she is at the Home Internationals in Wales 2011. Scottish Endurance Team Member, Scottish Dressage Team Member and Highland Pony Judge, Marjorie Grant and her Highland pony Trailtrow Eriskay have been a customer of ours for a number of years, her first saddle being a Native Pony Mountain and Moorland. In fact “Eriskay” was the first ever Highland Pony to achieve Gold in Endurance. 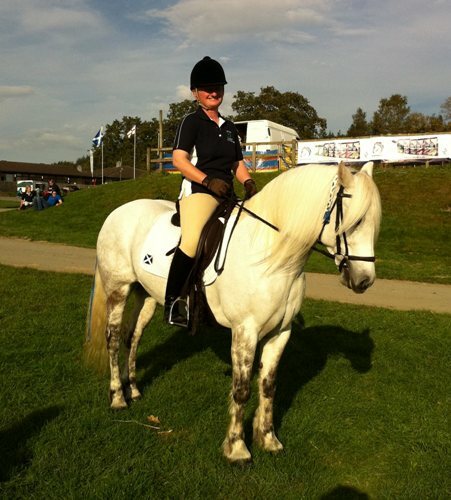 As she started to do more Dressage a specialised Dressage Saddle was required and in 2011 she purchased a Grand Prix Dressage Saddle in our Native Pony fit which has a flatter wider tree and flatter, wider weight bearing, flocked panel, Ideal for a wide and flat Highland Pony. In 2011 she then went on to qualify for the Scottish Regionals and Scottish Championships with scores Prelim at 70 to 77. Marjorie and Eri8skay also competed at the 2013 Scottish Dressage Champs, qualified for 2013 summer regionals at novice (couldn’t compete as she was booked to judge) they also qualified for and competed at BRC National Championships, Lincoln, and qualified for BRC DTM Champs in 2013. At the time of writing ( April 2014) Marjorie now competes at Elementary and recently won a Restricted Elementary test achieving 71.3% and has already qualified for the 2014 Scottish Dressage Champs and BD Summer Regionals at Elementary. In 2012 at the Highland Show sheltering from the rain on the stand Marjorie discovered the first of the Evolution Endurance saddles, made for Christine Yeoman’s Arabian horses and on display for the first time. On our next trip to Scotland we called to see her with the first of the saddles made with the flatter , wider Native Pony options and she was so pleased with the saddle she bought it and used it for the Home Internationals Competition that year. As a product tester for us Marjorie gives us invaluable feedback on the products she tests for us, she also competes very successfully in Sidesaddle however that isnt something we have ventured into… yet ! Here’s a video we made when Marjorie first tried her endurance saddle.